Butternut squash makes a lovely fall side dish, but have you considered it for salad? 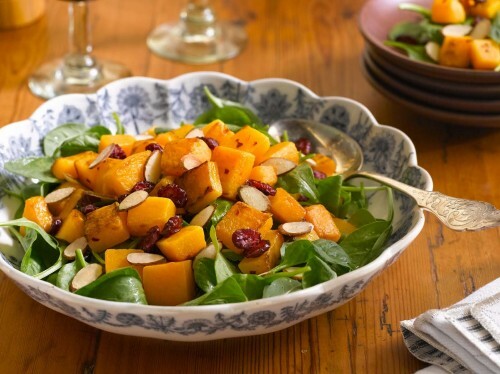 When Almond Accents asked me to create fall salad recipes, I thought winter squash would be perfect with their honey roasted almonds and dried cranberries. First, I roasted cubed squash with maple syrup, lemon juice, garlic and red pepper flakes. But it took too long, stuck to the pan, and there didn’t seem to be enough roasty-caramelized flavor to benefit the effort. When I don’t have patience with a recipe I know it needs to be easier. So my solution was to skillet-cook the squash cubes, mix with maple-lemon dressing, then serve warm over greens drizzled with the rest of the dressing. Simple! It’s fall-festive and colorful too, just right for a holiday table! Almond Accents take salads from plain to fancy in a jiffy and are available in 6 flavors in your supermarket produce section. Their newest flavors are Honey Roasted with Cranberries, Sea Salt & Cracked Pepper, and Sweet Roasted Pomegranate. Dried pomegranate seeds are crunchy, tart and sweet – new to me! Try this flavor in my Quinoa Salad with Edamame and Pom. See more recipes that I tested for Almond Accents by Cat Cora and other chefs . Spicy maple-sweetened squash with honey almonds and cranberries makes a festive winter salad or side dish. Red pepper flakes can be hot so use less for a little ‘cooler’ dish. Halve, seed and peel squash. Slice or cube into bite-size pieces. Heat a large skillet over medium heat. Add 1 tablespoon olive oil, squash, garlic, salt and red pepper flakes. Cover and cook 10-15 minutes until squash is just tender, stirring several times. Remove from heat. For dressing, whisk together remaining 3 tablespoons olive oil, maple syrup and lemon juice; add 2 tablespoons to squash. Stir in Honey Roasted Almonds and Cranberries. Serve squash warm or cool over arugula or spinach; drizzle with remaining dressing. *Kitchen Tip: See Rita’s Butternut Squash Soup for a simple way to cube squash. Recipe by Rosemary Mark. Photo by Amy Neunsinger. Styling by Kate Martindale. Rita’s Butternut Squash Soup recipe has a nice visual example of how to peel those hard squash. Very helpful. This salad looks beautiful and delicious. I plan to try it next time I get a butternut squash in my veggie box. I prepared this recipe at a class I teach at the YMCA yesterday and it got a great thumbs up! How do I get this onto my pinterest board? Hope you all have a great Thanksgiving weekend next week! Keep up the great work; love your blog! Thanks JoAnn, I’m delighted to hear the recipe was a success in your class! To post on Pinterest, click on the Pinit link on the right side of the blog then upload the URL for this post on Pinterest. Let me know if you need help and I can walk you through. Introduced a similar dish (sauteed diced sweet potatoes) to the Thanksgiving table a few years ago and it was well received–will have to try this one out! Its nice to cook the potatoes so quickly isn’t it. Happy to hear this idea sounds good to you! We’re definitely on the same wave length right now with squash salads, aren’t we. This looks perfect for the season, and I love the maple syrup dressing! !